One of the best Fringe traditions is the free Folk and Blues show put on at The Guildford Arms, located off the east end of Princes Street. Each year, the show is hosted by the Yard of Ale, stalwarts of the Scottish folk scene. Indeed, this year marks the 40th anniversary of the band’s formation. The four guys know how to entertain with an eclectic mix of songs. It all stems from their excellent musicianship on guitars, with some banjo, mandolin and fiddle appearing in the mix. 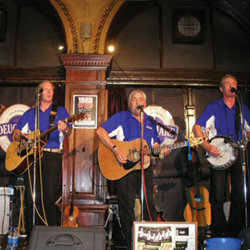 Naturally, they perform numerous Scottish and Irish favourites, opening their set with Braes of Killiekrankie. As well as their traditional folk song repertoire, they broaden out to include songs from Steve Earle, Bob Dylan, Rick Nelson and Lindisfarne. I particularly enjoyed their version of Guy Mitchell’s Singin’ the Blues. They end their set with the marvellous Girl from Belfast City. All through the show, many join in the choruses with obvious enjoyment and good humour. The whole experience is enhanced by the wide choice of real ale available.